The Mountain Goats (stylized "the Mountain Goats") are an American indie folk band formed in Claremont, California by singer-songwriter John Darnielle. The band is currently based in Durham, North Carolina. For many years, the sole member of the Mountain Goats was Darnielle, despite the plural moniker. Although he remains the core member of the band, he has gradually worked with a variety of collaborators, who have included bassist and vocalist Peter Hughes, drummer Jon Wurster, multi-instrumentalist Matt Douglas, singer-songwriter Franklin Bruno, bassist and vocalist Rachel Ware, singer-songwriter/producer John Vanderslice, guitarist Kaki King, and multi-instrumentalist Annie Clark. Throughout the 1990s, the Mountain Goats were known for producing low-fidelity home recordings (most notably, on a cassette deck boombox) and releasing recordings in cassette or vinyl 7" formats. Since 2002, the Mountain Goats have adopted a more polished approach, recording studio albums with a full band, while still maintaining organically emotional lyrical motifs. The band's name is a reference to the Screamin' Jay Hawkins song "Yellow Coat". Darnielle released his first recording under the band name, Taboo VI: The Homecoming, on Shrimper Records, in 1991. Many of his first recordings and performances featured Darnielle accompanied by members of the all-girl reggae band The Casual Girls, who became known as The Bright Mountain Choir. 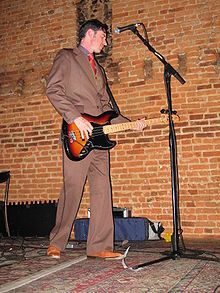 One of this group's members, Rachel Ware, continued to accompany Darnielle on bass, both live and in studio, until 1995.The first five years of the Mountain Goats' career saw a prolific output of songs on cassette, vinyl and CD. These releases spanned multiple labels and countries of origin, often released in limited numbers. The focus of the Mountain Goats project was the urgency of writing. Songs not recorded adequately to tape within days of being written were often forgotten. Cassette releases during this time include The Hound Chronicles, Transmissions to Horace, Hot Garden Stomp, Taking the Dative, and Yam, the King of Crops. In 1994, the Mountain Goats released their first full-length studio album, Zopilote Machine, on Ajax Records. It is the band's only full album featuring the entirety of The Bright Mountain Choir. By 1995, most of what could be considered classic Mountain Goats conventions (boom-box recording, song series, Latin quotes, and mythological themes) were abandoned in favor of a more thematically focused and experimental sound. This period was marked by Darnielle's collaborations with other artists including Alastair Galbraith and Simon Joyner. In November 1996, Darnielle announced a vow to "clear his musical tendency for profanity" to promote a more optimistic reception to the ideas outlined in his material. In 1995, the album Sweden was released. Soon after its recording, a sequel titled Hail and Farewell, Gothenburg was recorded, but never released. It remained unheard by the general public until 2007, when it was leaked against Darnielle's wishes. In 1996, the Mountain Goats released the album Nothing for Juice, and Full Force Galesburg the following year. Rachel Ware left the band between recording the two albums, and bassist Peter Hughes took over her position. Between 1998 and 2000, the Mountain Goats slowed down their prolific output, releasing The Coroner's Gambit in October 2000. The album partially returned to the band's roots, as most songs were sporadically recorded on Darnielle's old Panasonic RX-FT500 cassette deck Boombox, which produced a loud background noise to the songs. 2002 saw the release of two Mountain Goats albums: All Hail West Texas and Tallahassee. These albums mark a distinct change in focus for the Mountain Goats project, being the first in a series of concept albums that explore aspects of The Mountain Goats' canon in depth. All Hail West Texas featured the resurrection of Darnielle's early boom box recording for a complete album. Darnielle considers this album to be the culmination of his lo-fi recording style. Tallahassee, recorded with a band and in a studio, explores and concludes the relationship of a couple whose lives were the subject of the song cycle known as the Alpha Series. Also released that year was Martial Arts Weekend, attributed to The Extra Glenns, a collaboration with Franklin Bruno on several previously unreleased Mountain Goats songs. Following that recording, Bruno joined Darnielle in the studio along with bassist Peter Hughes, who is the second official member of the band and accompanies Darnielle on tour. These three musicians formed what was considered the Mountain Goats studio band. In 2004, the Mountain Goats released We Shall All Be Healed. The album marked a number of changes for the Mountain Goats, as it was the first time Darnielle worked with producer John Vanderslice, and the first album of directly autobiographical material. We Shall All Be Healed chronicles Darnielle's life with a group of friends and acquaintances addicted to methamphetamine in Portland, Oregon, though the album is set in Pomona, California. The following year, the band's second Vanderslice-produced album, The Sunset Tree, was released. Again autobiographical, Darnielle tackled the subject of his early childhood spent with an abusive stepfather. Darnielle had previously dealt with this subject in what he often refers to as the only autobiographical song he had written before 2004, the unreleased song "You're in Maya." 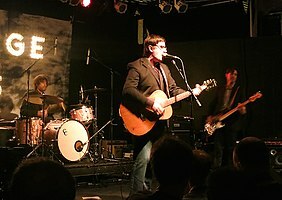 The Mountain Goats relocated to Durham, North Carolina in 2006, and issued Get Lonely, which was produced by Scott Solter, who had worked with Vanderslice on engineering for prior Mountain Goats records. Jon Wurster joined the group in 2007, playing drums on the last leg of the Get Lonely tour. The band recorded tracks for its next album at Prairie Sun studios. Entitled Heretic Pride, the album was released on 19 February, 2008. Produced by John Vanderslice and Scott Solter, the album saw Darnielle, Hughes, and Wurster joined by Franklin Bruno, Erik Friedlander, Annie Clark (better known by her stage name, St. Vincent), and members of The Bright Mountain Choir. American Alternative hip hop artist Aesop Rock released a remix of the track "Lovecraft in Brooklyn" from the album, and in return Darnielle contributed vocals to his album None Shall Pass, in the song "Coffee". In 2009, Darnielle and Vanderslice collaborated on the record Moon Colony Bloodbath. Released in a limited vinyl run of 1000 and sold during their "Gone Primitive" tour, the EP was a concept record about organ harvesting colonies on the Moon. This was followed by the next full Mountain Goats album, The Life of the World to Come, which released in October of the same year. The album is composed of twelve tracks, each one inspired by (and titled after) a single verse of the Christian Bible. In publicizing the record, the band made their first ever television appearance, performing "Psalms 40:2" on The Colbert Report, hosted by professed Mountain Goats fan Stephen Colbert. The Mountain Goats signed to Merge Records, home to drummer Jon Wurster's other band, Superchunk, in 2010. The label issued a new record by The Extra Lens, formerly The Extra Glenns, entitled Undercard, followed by another Mountain Goats LP, All Eternals Deck, in 2011. They were also chosen by Jeff Mangum of Neutral Milk Hotel to perform at the All Tomorrow's Parties festival that he was due to curate in December 2011 in Minehead, England, but were unable to appear due to a rescheduling. The band's fourteenth studio album, Transcendental Youth, was released in late 2012, and in early 2013 they played at Carnegie Hall in support of John Green and Hank Green in their "Evening of Awesome" performance. In July 2013, All Hail West Texas was re-released on vinyl. During an interview with Stereogum in August 2012, John Darnielle said that Amy Grant was his favorite pop artist, and noted that "Rich Mullins is one of the best songwriters I know of." Mullins was the songwriter who penned many of Grant's hits. The Mountain Goats released its 15th album, Beat the Champ, on 7 April 2015, again with Merge Records. According to Pitchfork Media, the album concentrates on the professional wrestlers Darnielle admired when he was a child and tries to develop and imagine their lives. Matt Douglas assisted the group in recording the album, and soon thereafter became a full-time member. In January 2017, the Mountain Goats recorded a humorous song per request of director Rian Johnson, depicting an alternate story of his upcoming movie, Star Wars: The Last Jedi. The song, titled "The Ultimate Jedi Who Wastes All the Other Jedi and Eats Their Bones", was published on Johnson's Soundcloud page. In February 2017, Merge Records announced the band's sixteenth studio album, titled Goths, to be released 19 May 2017. The band's music has been featured in the Showtime television series Weeds. "Cotton" was prominently featured in the season one episode "The Punishment Light", and "International Small Arms Traffic Blues" was featured in the season four episode "Yes I Can." The band performed the Theme to Weeds (Malvina Reynold's "Little Boxes") during the opening credits of Season 8, Episode 5. The songs "No Children", "Old College Try", and "Love Love Love" were each featured in separate episodes of the television series Moral Orel's third season, which featured major running themes of alcoholism, regret, and domestic discontent. The song "Love, Love, Love" was performed by Lili Rose McKay in the movie Welcome to Me. The band made their television debut on October 6, 2009, playing "Psalms 40:2" on The Colbert Report. On January 19, 2010, they played "Genesis 3:23" on Late Night with Jimmy Fallon. On February 23, 2011, they played "Birth of Serpents" in support of their album, All Eternals Deck, on the Late Show with David Letterman. The song "Up the Wolves", from the band's album The Sunset Tree, was featured in The Walking Dead's season four episode "Still". The song "Game Shows Touch Our Lives", from the band's album Tallahassee, is quoted in the epigraph of John Green's novel Paper Towns. Additionally, the song "Used to Haunt" was played in the credits of the film adaptation. The song "Heel Turn 2" premiered in the weather report from the podcast Welcome to Night Vale. ^ "The Mountain Goats Bio". mountain-goats.com. Retrieved June 7, 2013. ^ a b c d Nickey, Jason (2008). "The Mountain Goats: Biography". Allmusic. Macrovision Corporation. Retrieved February 16, 2009. ^ "The Mountain Goats". 4AD. Retrieved December 26, 2011. ^ a b "the Mountain Goats FAQ". themountaingoats.net. Retrieved February 16, 2009. ^ Brown, "Sermon on the Mount", June 1999. ^ a b "News Archive | High Heresy". The Mountain Goats. November 20, 2007. Retrieved December 26, 2011. ^ "John Darnielle Tells the Story Behind the Mountain Goats' Biblical New LP". Pitchfork Media. September 8, 2009. Retrieved October 7, 2009. ^ a b "All Lanes Merge Immediately". Mountain-goats.com. August 5, 2010. Retrieved December 26, 2011. ^ "Mountain Goats All Eternals Deck Details". Stereogum. December 9, 2010. Retrieved December 26, 2011. ^ "ATP curated by Jeff Mangum (Neutral Milk Hotel)". All Tomorrow's Parties. Retrieved December 26, 2011. ^ "Just Under 1,000 Words About Our New Album". Mountain-goats.com. July 9, 2012. Retrieved July 9, 2012. ^ Locker, Melissa (August 24, 2012). "Turntable Interview: The Mountain Goats". Stereogum. Stereogum. Retrieved 25 May 2016. ^ "The Mountain Goats - Beat the Champ". Merge Records. Retrieved 14 April 2015. ^ Gordon, Jeremy (6 April 2015). "Album Review: Beat the Champ". Pitchfork. Retrieved 14 April 2015. ^ Darnielle, John (20 August 2016). "John Darnielle's Twitter". Twitter. Retrieved 20 November 2016. ^ Kaye, Ben. "John Darnielle's song "The Ultimate Jedi Who Wastes All the Other Jedi and Eats Their Bones" is about Rian Johnson's The Last Jedi — listen". Consequence of Sound. ^ Arcand, Rob (22 February 2017). "New Music: The Mountain Goats Announce New Album Goths, Share "Andrew Eldritch Is Moving Back to Leeds"". Spin. Retrieved 23 February 2017. ^ Kaye, Ben (22 February 2017). "The Mountain Goats announce new album, Goths, share "Andrew Eldritch is Moving Back to Leeds" — listen". Consequence of Sound. Retrieved 23 February 2017. ^ Lange, Jeremy (22 February 2017). "The Mountain Goats Announce New Album Goths, Share "Andrew Eldritch Is Moving Back to Leeds"". Paste magazine. Retrieved 23 February 2017. ^ "Weeds Music". Showtime. Retrieved October 7, 2009. ^ "Little Boxes". Retrieved July 30, 2012. ^ Brown, Jake (January 21, 2010). "The Mountain Goats on Jimmy Fallon". Glorious Noise. Retrieved December 26, 2011. ^ "Analysis: What's up with the epigraph?". Shmoop. Retrieved 27 August 2015. Five Tools Peter Hughes webpage with band photos and tour journals.